Lowdown: The sequel to Return of the Jedi arrives, more than thirty years later. Star Wars may be just a movie series, but clearly it has a lot of personal meaning for me. As mentioned before, when asked "what was the first movie you saw at the cinemas", my answer is Empire Strikes Back even though it is clearly not the truth; it's just that Empire was the first MOVIE in my life. Similarly, I maintain vivid memories of how I did not get to watch Star Wars, memories of a type I do not hold for other movie. It is also no coincidence none of the Star Wars movies has ever been reviewed here. A lot has happened over the years, though. I Matured, for a start, and then we had those horrible prequels. Something happened between those two: Star Wars had stopped becoming the stuff of dreams and turned into yet another phenomenon I grew out of. However, to say it does not hold a place of reverence would be to underestimate its power; even though I walk this earth pretending the Star Wars universe had ceased to exist since the second Ewoks first popped into existence, a part of me - a significant part - is still looking for the next Star Wars. In other words, The Force Awakens and its creator J.J. Abrams carry a lot of weight on their shoulders. Can they deliver? Unexplained reliance on English actors? Check! Important information hidden in a robot at the start of the film? Check! That robot being cute with more personality than everything else on screen? Check! A masked, dark clad, baddie? Check! The rebels having the best pilots, the baddies failing their targeting academy? Check! A super weapons, aka Death Star, at the hands of the baddies? Check! A canal chase flight scene? Check! A Mos Eisley like break in the middle? Check! Silly (?) jazz music at said Mos Eisley? Check! I can go on and on but I will not for fear of blooping. Suffice to say that even the John Williams score offers nothing in the field of originality; no Imperial March that will power ringtones in thirty years' time to be found here. Not even in a year's time. Actually, I'm lying. There are two things The Force Awakens has that Star Wars did not: it's got powerful female heroes at the very centre, and it's got a black character. Not only that, said black character is a storm trooper turned goodie. But that is it for originality. What The Force Awakens comes heavily loaded with are things that fail to make sense. Take the main plot driver, the search for the reclusive Luke Skywalker (that info hidden in the robot is made of clues for Luke's whereabouts): why would that be worth all this effort? Or, why does the chief baddie, The Force Awakens equivalent of an Emperor, look like Gollum (it's played by him - Andy Serkis - too)? Where did said baddie come from in the first place - where did he hide during the days of the original trilogy? [My theory: he's Yoda's son.] How did this First Order, the villains of our new movie, take over the former Empire's resources, and why did the Rebels let them do so? Talking baddies, why do they have to wait for their weapons to fully charge when it can still do a hell of a job half charged? Again, I can go on and on but will not for fear of blooping; suffice to say The Force Awakens treads over very shaky grounds. I mentioned some nice characters introduced in The Force Awakens. Probably what impressed me the most was Leah, now Chief Rebel, who is portrayed as a normal looking woman of middle age, as opposed to the glamour queens Hollywood usually throws down our path for its version of middle aged women. On the other hand, the darkly clad masked baddie of The Force Awakens is a joke, a farce of evil, a failure from start to finish, a guy that loses against two inexperienced fighters holding a lightsaber for the very first time (it seems The Force Awakens is very fast at handing out Jedi mastery certificates). Add it all up, and The Force Awakens feels like the Star Wars Battlefront video game released just a couple of months ago: it looks "wow", it's entertains, it's often exciting, it's got characters one easily falls in love with even if these are inanimate objects such as rolling balls or old spaceships, but it is also oh so very shallow. Best scene: It was good to see Han Solo back, my first and biggest cinema love. The Kessel Run joke was good, too, an indicator for a movie that does not take itself too seriously. The Force Awakens is nothing more than Star Wars 2.0, a remake of the original using some new characters, a bigger budget and modern technology. It is a very entertaining film, no doubt about it, but the sole novelty it offers to the Star World universe is the promise of sequels to come in the future. I argue this is not enough. 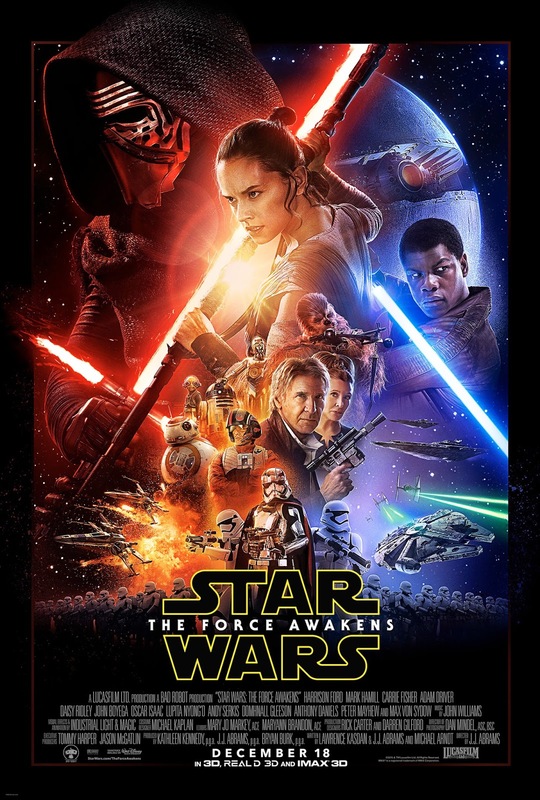 The Force Awakens, therefore, is not the Star Wars movie I was looking for. 3.5 out of 5 recycled crabs from me. P.S. Do wake me up when Star Wars actually has something new to offer.